I got to hold Hadassah in my arms finally! Megan playing with her little “sissy” Hadassah. 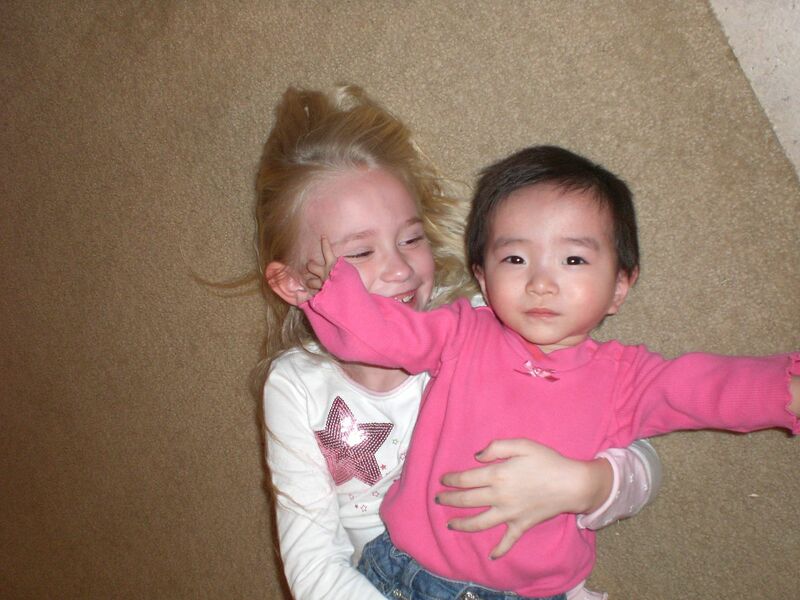 You may remember my friends Pat and Kim Weber, who adopted the special needs baby from China, Hadassah. Many other people and I prayed for her to be part of the Webers’ family by Christmas 2009, and God answered our prayers. Well, I finally got to hold Hadassah in my arms this week! On Tuesday our youngest daughter Leah and I drove to their hotel in Overland Park, KS, to see Kim and the kids while Pat worked, and enjoyed the hotel’s swimming pool and hot tub. “It’s a hard life, but somebody’s got to do it!” The Kansas City rain cleared long enough for all of us to get in the water awhile, then we walked a block for a lunch of philly cheesesteak sandwiches at Chartroose Caboose. It was so good to see Kim and the kids again, and Hadassah is gorgeous and so sweet! She has a very calm, peaceful personality. She is thriving in this loving family, learning English words quickly, and most importantly she’s learning about Jesus! She is even using her hand some that was defective at birth. The fingers on this hand are even straightening some, and she is in regular physical therapy to work with it. Her progress in physical therapy has been great. Hadassah is in very good health, gaining weight on Kim’s delicious, home-cooked meals. She is so well bonded to her parents and siblings, it is just a God thing! And Hadassah loves Sesame Street. In the second video, you will hear Hadassah saying my name (YES! ), some of my family’s names, and the names of the characters on Sesame Street. The “sausage” Megan is holding at the end of the video is the long pillow for the hotel couch that Hadassah loved to play on, lol! Hadassah is adorable. Oh, I wanted to keep her here! Thanks again for all your prayers for her, and please continue to keep Pat, Kim, and their family in prayer for provision for the adoption. When I saw Hadassah and held her, all I could do was just praise God for this miracle of love. Hadassah is living proof that God answers prayer! ← Are you a prickly pear?